Tensions between the Scots and the English were high during the reigns of King John and King Henry III and there were many disagreements over the exact course of the Scottish border. 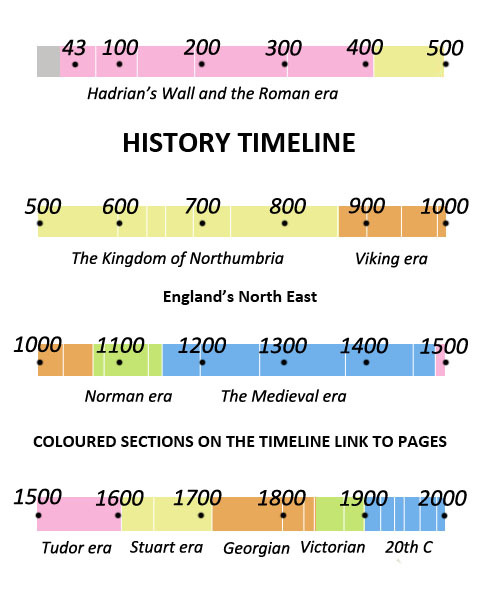 Meanwhile Newcastle's importance as a town and port was increasing and important new defences were added in 1247 and 1265. Prince John, brother of the late Richard I, becomes King of England. Pilgrim Street is among Newcastle's streets. It is the site of inns and places of hospitality used by travellers and pilgrims. Roger De Ferry has killed the last of Durham's wild boars. They have roamed the forests here since ancient times. William of Scotland claims Northumberland as his own in a meeting with John. King John grants Hartlepool 'Royal Burgh' status giving its merchants the same rights as Newcastle. 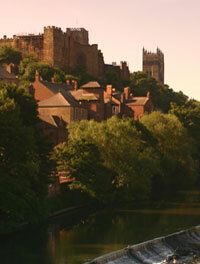 The Bishop of Durham claims Hartlepool should be a bishop's burgh. In 1203 John held a conference at Norham with William of Scotland to ensure peace, but tensions continue to mount. John has now marched to Norham to prepare for an invasion of Scotland but William has submitted to him. Alexander, son of William of Scotland, gives his allegiance to John at Alnwick. In 1214 Alexander becomes the new king of Scotland as Alexander II. King John visits Corbridge in the hope of finding Roman treasure which is said to be buried there. It follows similar searches in 1202 and 1208 but he finds nothing. Meanwhile John confirms certain privileges held by the leading merchants at Newcastle. J ohn also strengthens Newcastle castle. The Magna Carta is signed by King John in the presence of the barons. It reduces the excesses and abuses of the monarch's power. The Northumberland barons are still not happy and transfer allegiance from John to Alexander of Scotland. Alexander raids as far south as Newcastle. John burns Morpeth, Alnwick and Berwick and drives out the Scots and then attacks the Scottish lowlands. Cumbria is harried by the Scots as John returns to England and Bowes Castle in Teesdale is attacked by John's enemies. John dies and is succeeded by the nine-year-old Henry III. The Scots raid the north throughout the following year. Alexander II of Scotland marries Henry III's sister, Joan, at York. A lake called the White Mere Pool is mentioned at this time. It is situated between Boldon and Heworth and will later be called the White Mare Pool. The Bishop of Durham sets aside an extensive area of Weardale as a hunting ground. Meanwhile the official residence of the Archbishop of York has been established at Bishopthorpe just outside York. Although normally associated with Sherwood Forest in Nottinghamshire and the reign of Richard I, most of Robin Hood's activities took place in the South Yorkshire forests during Henry III's reign. Robin may also have been involved with smuggling at Robin Hood's Bay on the North Yorkshire coast. Plague breaks out in populous Newcastle, killing many over three years. 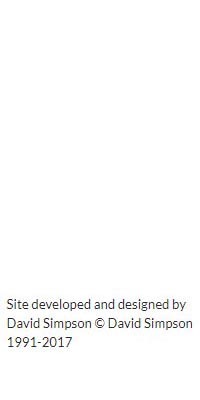 The Treaty of York recognises the rights of Scottish kings in Tynedale and Cumberland but not sovereignty. Henry III and Alexander II agree that the Scottish border should be fixed along the Tweed-Esk-Solway line. It is said that a man employed by the Prior of Durham to entertain the monks fell to his death this year while walking on a tightrope stretched between the central tower and a western tower of Durham Cathedral. Henry III informs the prior that he has destroyed his chances of beco ming the next Bishop of Durham. Disputes over the exact course of the Scottish border arise but Henry III and Alexander II meet at Newcastle to declare a truce. Alexander's troops have been threatening the border all year and had besieged Prudhoe Castle. 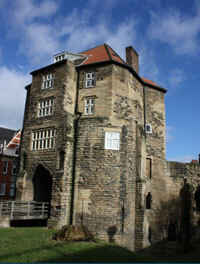 Henry III builds Newcastle Blackgate, an extension of the castle. A fire in Newcastle-upon-Tyne destroys the old Tyne bridge. It may have incorporated part of the old bridge of Roman times. An attempt is made to fix a proper Scottish border. Border laws are established including the rights of masters to reclaim servants who seek refuge across the border within 40 days. Alexander II dies and is replaced by his eight-year-old son, Alexander I II. William, Rector of Wearmouth, establishes the first College at Oxford University, bequeathing money for the maintenance of ten theological students. Newcastle's civic status is increasing. In 1249 Henry III established a mint here and this year the Chief Bailiff earned the title of mayor. Alexander III of Scotland marries Henry III's daughter Margaret at York. The marriage takes place in St Mary's abbey for a dowry of 5,000 marks. Alex is ten years old, Margaret is 11. Baliol College is established at Oxford after John Balliol of Barnard Castle insulted Walter Kirkham, the Bishop of Durham, in a land dispute. As a penance, Balliol agrees to finance students at Oxford to form what becomes Baliol College. Newcastle is granted a right to construct defensive walls. The Isle of Man and the Hebrides are sold by Norway to Alexander of Scotland. Held by Norway since Viking times, they still speak Norse. Middleham Castle in Wensleydale passes into the hands of the powerful Neville family of Raby Castle by marriage. Bishop Stitchill of Durham establishes a hospital at Greatham. Edward I becomes the new King of England.